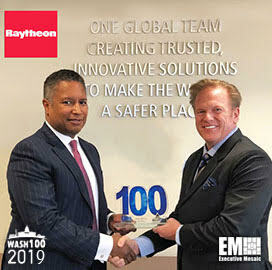 Jim Garrettson, founder and CEO of Executive Mosaic, presented John Harris, CEO of Raytheon International and vice president of Business Development of Raytheon, with his second consecutive Wash100 Award on Wednesday. Executive Mosaic recognizes Harris for securing several major contracts for Raytheon and supporting projects in defense, civil government and cybersecurity. We are ecstatic to present the most coveted award in government contracting to John Harris of Raytheon. Harris joined Raytheon as a member of the Contracts Leadership Development Program in 1983 and has held several leadership roles of increasing responsibility within the company. Recently, Harris was general manager of Raytheon Intelligence, Information and Services. He’s also been the president of RTSC, vice president of Contracts and Supply Chains and Operations and Contracts for the company’s former Electronic Systems business. In addition to his current positions, Harris chairs the board of directors for Raytheon Canada Limited and serves on the board for the Atlantic Council, the Council of Trustees for the Association of the U.S. Army, the National Defense Industrial Association and the National Advisory Council on Minority Business Enterprise with the U.S. Department of Commerce. Harris received his bachelor’s of science degree in Business Administration with concentrations in Finance and Operations from Boston University. He’s also graduated from Raytheon’s Advanced Management program and is a qualified Raytheon Six Sigma™ Specialist.